Scranton PA Water / Mold / Asbestos / Radon Experts! But that isn't all that sets us apart. As a Truly Local Company, we are proud that when calling our offices, you will reach someone in Northeastern PA. Someone that knows the area, and how to pronounce the names of the towns! And without a franchise system pulling us to far off parts of the country, you know We're Here For You®, and that's never going to change. At Disaster Blaster though, we don't rest on our laurels, we're also The Local Industry Leader, being the only company in the area able to complete a project from beginning to end, including highly regulated industries such as Asbestos Abatement and Radon Mitigation. We continue to leverage our years of experience to drive down the repairs necessitated by a claim as well through advanced processes and techniques that are proven to work. Of course, should you have a need for Repairs, we're more than happy to handle that for you too! Others may try to duplicate, but there's only one Disaster Blaster! • Disaster Blaster (located in Scranton) was named The World's Greatest Indoor Environmental Service and featured on the popular national television program "World's Greatest..."
• What is now the City of Scranton was first settled in 1778 by Isaac Tripp (Who's home still stands in the Tripp Park Section). • Scranton has a population of 76,000 people as of the 2010 Census. 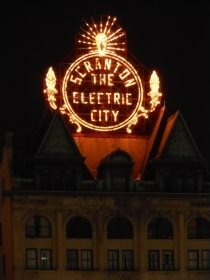 • Scranton became known as the Electric City when electric lights were introduced at Dickson Locomotive Works in 1880. • In 1886 the nation's first successful, continuously operating electrified streetcars began operating in the city. • The industries responsible for the buildup of Scranton were Steel, Iron, Silk, and of course Coal. • In the 1930's, Scranton's population was above 140,000 people.